What better place to enjoy a fall team building activity than on the Chesapeake Bay aboard The Liberté? If you are now planning a corporate event for your team this fall, what better place to enjoy a fall team building activity than on the Chesapeake Bay aboard The Liberté? As you embark on an exciting sail with your team, you can enjoy beautiful views along the coast of Annapolis and create an unforgettable memory with your coworkers. As you plan the details of your upcoming corporate event, consider the many reasons to enjoy an Annapolis day sail with your team aboard The Liberté. With the water as a venue for your corporate event, your teammates can have fun and interact in various exciting activities throughout your sail. As you sail along the Chesapeake Bay on The Liberté, you and your coworkers will also enjoy plenty of room to eat delicious food, listen to your favorite music, and take part in great conversations in a new and adventurous atmosphere on the water. Make the most of a beautiful fall day with your team by hosting your corporate event on the water. While a sail aboard The Liberté is always exciting, sharing a sail with your team as a team building activity can make for an enjoyable day spent on the water. Create a fun memory with your team by incorporating our customized team building programs into your sail! With this program, your coworkers can learn something new together and bond as a team. Bring your company closer as a cohesive unit with a great sail around Annapolis this fall. With a sail aboard The Liberté, your corporate event will serve as a unique opportunity for you and your coworkers to enjoy a beautiful autumn afternoon of team building and bonding on the water. Why limit your corporate event to only an indoor activity? Start your season of fall fun with a beautiful sail on The Liberté and make the most of the excellent weather and colorful fall scenery. 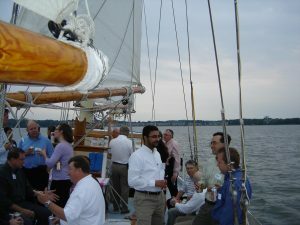 Enjoy Your Corporate Event in Annapolis with a Sail Aboard The Liberté! This entry was posted on Friday, September 21st, 2018 at 9:59 am. Both comments and pings are currently closed.